Welcome to the Macungie Historical Society! 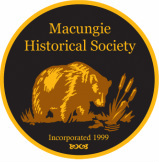 The purpose of the Macungie Historical Society is to promote the discovery, collection, preservation, archive, display, interpretation, and publication of the history, historical records, culture, landmarks, artifacts, memorabilia, and data of, and relating to, the Borough of Macungie and its surrounding areas. The official registration and financial information of the Macungie Historical Society may be obtained from the Pennsylvania Department of State by calling toll-free, within Pennsylvania, 1-800-732-0999. Registration does not imply endorsement.